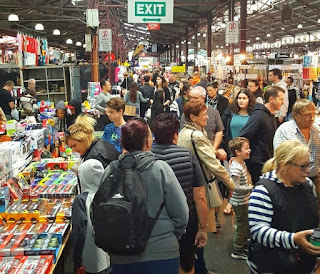 There is a lot of talk about creating new set-ups in the Upper Market at QVM with facilities like containers, but is the humble open stand still the best? The Upper Market has been criticised for its “S” format. That is where customers are required to walk up one aisle, turn left or right at the end, and continue that process in the next aisle. Potentially they will walk ten aisles to do their shopping and each day many of the traders change places. It has been suggested that modern convenience imperatives make that process obsolete. Certainly, shopping convenience has become an important part of shopping in a retail revolution. We now have calls for radical guidance facilities at QVM to help customers and even a suggestion that traders should be located in the same place every trading day. According to one management representative that could certainly be achieved. Then there is the quality of merchandising and presentation. First, Victoria St. and F Shed storage areas were converted to shops, then containers in String Bean Alley were installed, and then PODS under the sheds were trialled. All these measures were designed to make it easier to raise the level of product presentation and hopefully make us more appealing to some key groups of consumers. There is little doubt that such measures do give us more flexibility to meet consumer demands, or at least add a string to our bow. They certainly add potential flexibility to trading hours and help achieve that “market of markets” concept that means an offer can be available at QVM across a broad spread of days and hours. But the lure of the aisles remains and we know that because many customers still prefer to shop the sheds. Traders who operate permanent structure and open stand facilities know that the permanent structure doesn’t necessarily guarantee better takings. In fact there have been many instances where open stands consistently outperform the same offer in a permanent structure whether it be Victoria Street shops, F Shed, or String Bean Alley. The point here is that like many aspects of retailing at the moment, we can take little for granted. Customers like variety and adventure, and they like the availability of aisle shopping. At stalls they can pretty much see the whole offer from the aisle and they can shop with little interference. Contrast that with trying to get customers to step into a shop or a container – it can be difficult. Populating String Bean Alley with more containers will be a very interesting exercise. Will that “completeness” improve sales in the aisle? Some current tenants are cautiously predicting a 10-20% boost during the day market. The demand for permanent structures from traders is clearly high. There will be more applications than available containers in String Bean Alley, and that will often be driven by operating convenience for traders and the opportunity to try new ways of trading. But if maximising sales is your driver, the argument has yet to be settled on whether open stands or permanent structures are better. Some have managed to get a foot in both camps and maybe that is a wise move. 06/01/2019 21:46:38 Shops versus sheds "Greg are market stall holders becoming confused? Are they trading convenience that is the ability to lockup and leave as opposed to a stall setup time issues etc? Talk to your customers and the overwhelming reply is that my customers want a market to be a market. They like it when it has soul, the salt of the earth. When they want a sanitised product, air conditioning etc they go to the Chadstones ...they still have to walk but each centre be it here or anywhere in the world offers the same shopping experience. Are we not unique? If we continue to trial static displays are we failing our customers?? Your comments please."